It is said that you really reach fluency in a second language when you feel comfortable enough to joke around in it. I can attest to that reality. After 4 or 5 years of living in Argentina, that I was able to call (and this was before caller ID reached universal status) and greeting them with “Hola, gallego“* and delight in their utter inability to figure out who I was. Does an imported foreign institution finally gain cultural currency when the locals can apply slang terminology to it? For those of you who don’t read Spanish, what Gustavo is talking about is the Ben Roethlisberger to Martavis Bryant bubble screen passes, and the entire Todd Haley horizontal offense the Steelers tried to mount, instead of trying to pound the ball with Le’Veon Bell or hit Bryant and Antonio Brown downfield. “Choto” is a very Argentine word, and is likely exclusive to the dialect of Spanish spoken in the Rio de la Plata. What does “Choto“ mean…. …Well, this is a family friendly site, so any translation needs to be made with care. “Choto” means to, hum, let’s say a certain piece of the male anatomy that’s short, and one that comes up short at shall we say in opportune times. “Gallego,”* which in certain contexts can be highly disrespectful also has much more affectionate, and playful uses. And that’s the beauty of this anecdote. There’s no real English translation of “choto,” there’s no single English word or expression that carries the exact cultural or linguistic weight. Yet, “choto,” very much describes the play of the Steelers offense, save for Antonio Brown and Jesse James, on Sunday against the Browns. With all that said, I realize this could quite well be the linguistic equivalent of a “You had to be there” type of moment. If so fair enough. But if you can’t quite fully grasp the linguistic side of it there’s something else that you should be able to hang your hat on…. 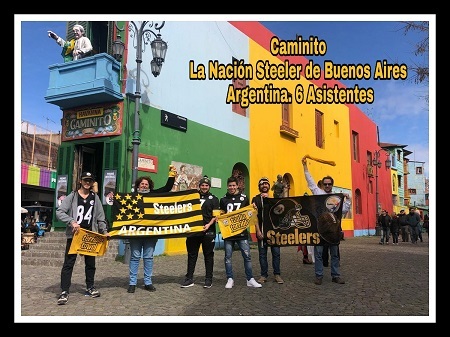 The Steelers Nation’s colony in Argentina might be small, but the porteños are making Steelers football their own! *Taken literally a “gallego” as an immigrant or a descendant of an immigrant from the province of Galacia, in Spain; colloquially saying “Hola gallego” is sort of like saying “What’s up hoss?” albeit it comes with an affectionate barb, because the stereotype of a gallego is someone who is always a half step-behind the times. 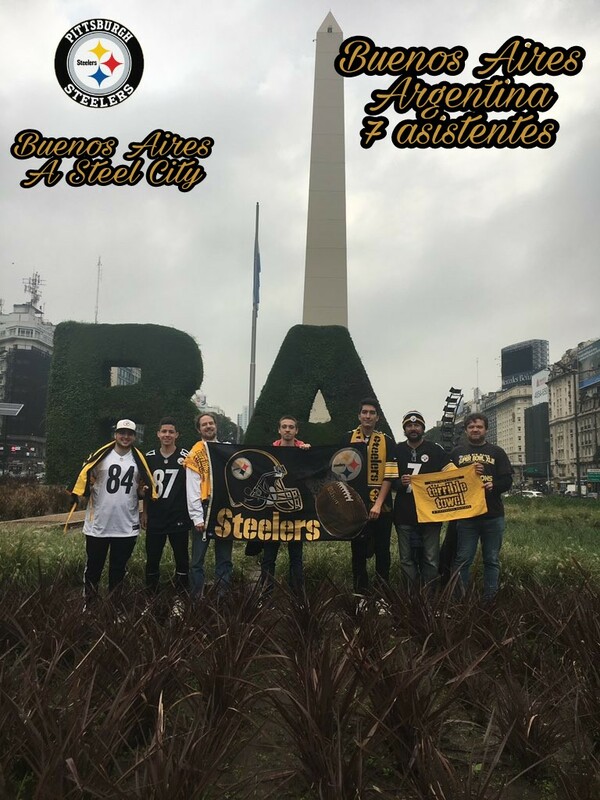 Pittsburgh Steelers fans will gather at Buenos Aires’ Obelisco on Sunday September 3rd as part of the #SteelersWorldWide Photo. Think Big, start small. I’d like to say that’s how all of this got started. And, in some ways it is true, because this movement goes way beyond what any one Pittsburgh evangelist could ever hope to do. The leg of my life journey that took me to Buenos Aires began in 2001, in an effort to open new horizons. Opening those new horizons meant switching jobs, switching languages, switching transport modes, swapping suburban living for city life and giving up a fair number of comforts in a quest to gain something new, something unique. Those were all challenges I was happy to make. But there was one sacrifice that pained me more than all (but one) of the others. Back in 2001, NFL Sunday Ticket was a included in DirectTV Argentina’s standard offering, but DirectTV was well beyond an English teacher’s means. High speed internet and streaming were years away, certainly when measured in budget terms if not in terms of technology. So be it. You take the good with the bad. So I resigned myself to the reality that for the next portion of my life I’d be following the Steelers by hurriedly loading Pittsburgh Post-Gazette articles into memory on a dial up modem, and watching Monday Night and Sunday Night games broadcast on tape delay at 2:30 am on ESPN. But I also remained determined to do what I could to spread the word about the Black and Gold to anyone who was interested. One of the things I noticed about porteño culture celebrate the triumphs of their soccer teams by posting flags whether they root for Boca, River, Racing, San Lorenzo, or Velas Sarfield. So on the opening day of the Steelers 2001 training camp, with permission of my hosts, hung my Steelers flag on the terrace of the home I was living in. My Argentine “Aunt and Uncle” were amused by it. Any passers by who paused at the bus 141 and 55 stop in Flores’ Jose Marti and actually noticed the flag could have only been puzzled. Times change. Before Steel Curtain Rising was founded, I’d do post-game summaries by email signing off on as “President, Pittsburgh Steelers Fan Club of Buenos Aires” which was a club of one. Although it took me until the Steelers win in Super Bowl XLIII, I’ve met and befriended several other Steelers fans here in Buenos Aires. And our movement is gaining momentum…. 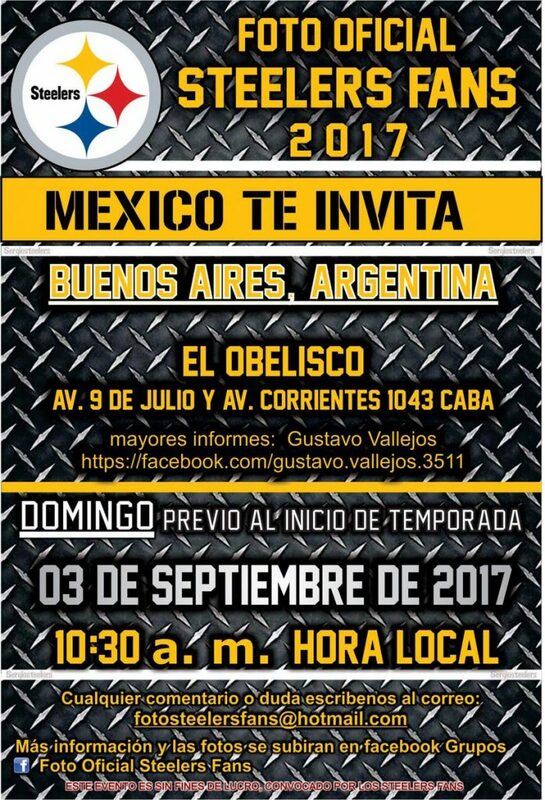 The movement is growing, and on Sunday September 3rd, Steelers fans in Buenos Aires will gather at the Obelisco to take a group picture. We’re starting bright and early at 10:00 am. Bring your Steelers gear. Bring your terrible towels and, as we await the first Steelers regular season opener to feature Ben Roethlisberger, Le’Veon Bell, Antonio Brown and Martavis Bryant on the field at the same time, let’s show the world that Steelers Nation’s Latin America contingent stand united from the Rio Grade to the Tierra Del Fuego! Well folks, in our heart of hearts, everyone in Steelers Nation knew the 2014 Pittsburgh Steelers magical mystery ride had to end at some point. Most didn’t think that sad event would occur vs. the Baltimore Ravens. But it did. At the end of the day, on this night at Heinz Field, the Baltimore Ravens simply played a better game, and were a better team. None of that should detract from what this team has accomplished under Mike Tomlin during 2014. This is a young team that found its identity down the stretch. And if they came up short in the playoffs, there are now 30 some players who never wiffed post-season football, including the likes of David DeCastro, Martavis Bryant, Markus Wheaton, Stephon Tuitt, and Kelven Beachum, who now know what it is like to buckle the chinstrap in a game that is for all of the marbles. Yes, this playoff loss to the Ravens was a disappointment. And as it is probably the final game for Ike Taylor, Troy Polamalu, and also perhaps James Harrison and Brett Keisel, its a sad way to end. But the 2014 Steelers have no need to hang their heads in shame. They returned the franchise to the post-season after twin 8-8 seasons and, hopefully, in the process learned some valuable lessons which they can build on. Its now 2:14 here in Buenos Aires. Thanks to Carlos, Carlos, Claudio and Sergio who came out to Sugar to join Gustavo and I for the game at Sugar in Buenos Aires. Steel Curtain Rising will have a full analysis later tomorrow. Until then we ask everyone in Steelers Nation to join us in saluting the 2014 Pittsburgh Steelers. The Pittsburgh Steelers Fan Club of Buenos Aires is calling on all of the Black and Gold faithful in the porteño capital to join us to watch the Steelers-Ravens game at the bar Sugar, in Palermo. Mind you, this is an informal gathering, but Sugar is the top expat bar in the city, and regularly shows NFL games. It will also give you a chance to meet El Dr. de Acero, the master behind this site’s Spanish articles, making Steel Curtain Rising the only bilingual blog in Steelers Nation. That’s 5-3. Not a perfect record, but we’ll take it. Be part of the trend. Join us at Sugar (Costa Rica 4619) to watch the third Steelers-Ravens match up at Heinz Field during the Mike Tomlin era. Queridos amigos de la Nación Steeler. 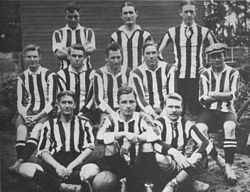 Los Acereros llevan ventaja histórica de 15-7 (3-0 en postemporada). En los juegos disputados este año hubo una victoria para cada equipo. Sin embargo, el último encuentro disputado en Pittsburgh, el QB Ben Roethlisberger ingresó al libro de records al lanzar por segundo juego consecutivo, 6 pases de TD y alzarse con la victoria por 43 a 23, tomando revancha del primer encuentro en Baltimore en donde estos se impusieron por 26 a 6. La intensidad será invitada de honor a esta noche. Intensidad en las tribunas y en el campo de juego. E intensidad en cualquier lugar del planeta en donde se reúnan al menos 2 fanáticos de los Steelers para acompañar a su equipo. Allí donde ondeen las Terribles Toallas Amarillas. Buenos Aires no podría ser la excepción. Aquí también ondearán la Toallas Amarillas. El punto de reunión será el Sugar Bar, en Costa Rica 4619, en el Barrio de Palermo. Allí los esperamos un rato antes del partido. Watch Tower: Can Cowher Counter Balance Phil Simms’ Anti-Steelers Bias? NFL week 6 brings the Pittsburgh Steelers at the New York Jets and a decision by CBS gives the Watch Tower a chance to shift its focus from “print” to broadcast journalism. The news of course is the announcement that former Pittsburgh Steelers head coach Bill Cowher will join Jim Nance and Phil Simms in the booth to call the game, adding intrigue for a number of reasons. Bill Cowher once mentioned that he did not know how preceded Chuck Noll as coach of the Steelers. That man was none other than Bill Austin, and ironically at 0-4 the Steelers are amidst their worst start since Austin’s final year in 1968. But that’s not CBS’ real motive here. CBS is taking an unprecedented step in sending out his studio team to cover their respective former teams, meaning that Boomer Esiason will do the Cincinnati-Buffalo game while Shannon Sharpe returns to Denver to commentate on what promises to be the NFL’s version of the Hunger Games – Denver vs. Jacksonville. Its an interesting broadcast concept, although one my fairly ask why not ask Dan Marino to do Miami’s game. Steelers Nation’s Golden Lining? Can the Chin Compensate? For Steelers Nation the prospect of Cowher joining the Nance and Simms in the booth perhaps offers a golden lining. Bill Cowher has pledged to call the game, which speaks well of him. Can Cowher compensate for Phil Simms’ anti-Steelers bias? But Phil Simms has an anti-Steelers bias, plain and simple. Steelers Nation has long complained about this, but the Watch Tower can prove it! As regular readers know, Steel Curtain Rising is written out of Buenos Aires, Argentina. And yours truly is married to a beautiful Argentine woman. My wife accepts and sometimes even enjoys (although its hard to get her to admit it) watching Steelers games with me. But being Argentine, she knows nothing of Phil Simms alleged “Anti-Steelers bias.” Moreover, she most certainly doesn’t even know the name “Phil Simms” nor does she recognize his voice or face. Then Bill Cowher should call them out for each and every one of those failings. But when Simms decides bend over backwards in his praise of how the Jets have managed to fill the position for the back up place kicker holder position while criticizing the Steelers practice squad decision choices, hopefully the Chin will perk up and defend the Black and Gold’s honor.